You asked, I listened. In my inaugural Guide to Game Theory video (and for my 100th post! 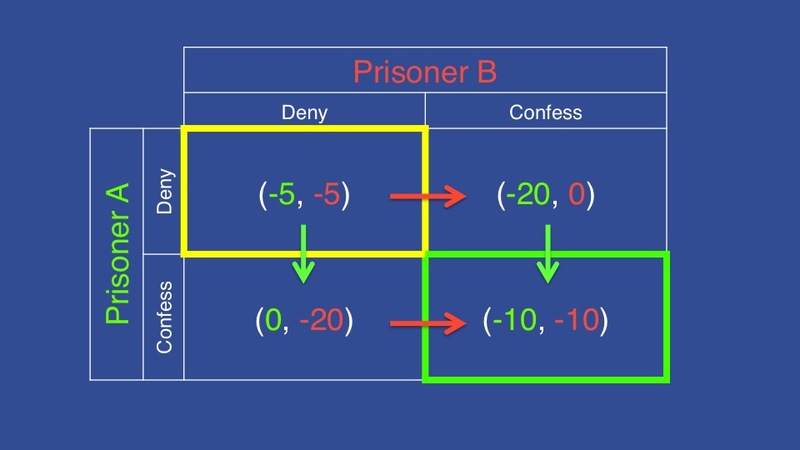 ), I’ll explain the concept of a Nash equilibrium. In other words, given another player’s choice, your best choice is obvious. If this is true for every player, that combination of choices is a Nash equilibrium: more specifically, a pure-strategy Nash equilibrium (since you’ll do the same thing every time). 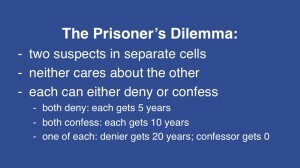 To illustrate the idea, we’ll use a basic concept of Game Theory: the Prisoner’s Dilemma. I’ll introduce the concept of a payoff matrix, which is used to put these options in visual form. 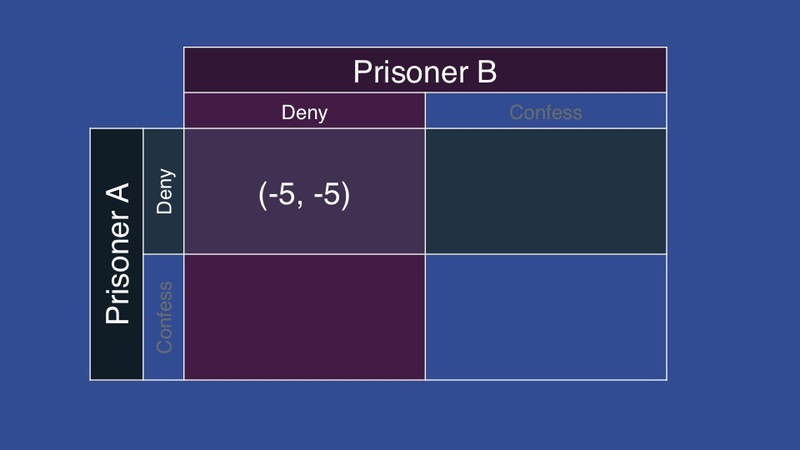 For example, if both prisoners deny, you’d put their “payoffs” (jail terms) in the cell where the appropriate row and column meet. As we’ll see, the Nash equilibrium might not be the best option for the group – or for any individual player. 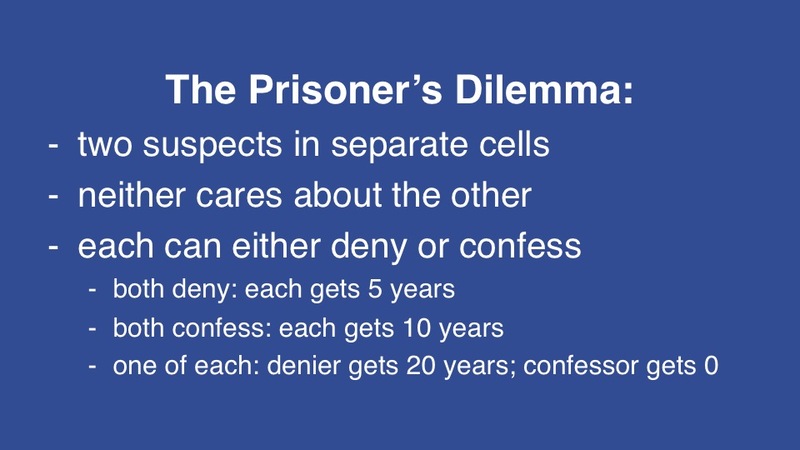 In the Prisoner’s Dilemma, for example, each prisoner will be better off denying a crime, but both have incentives to confess to it – and together, will double their stays in jail. 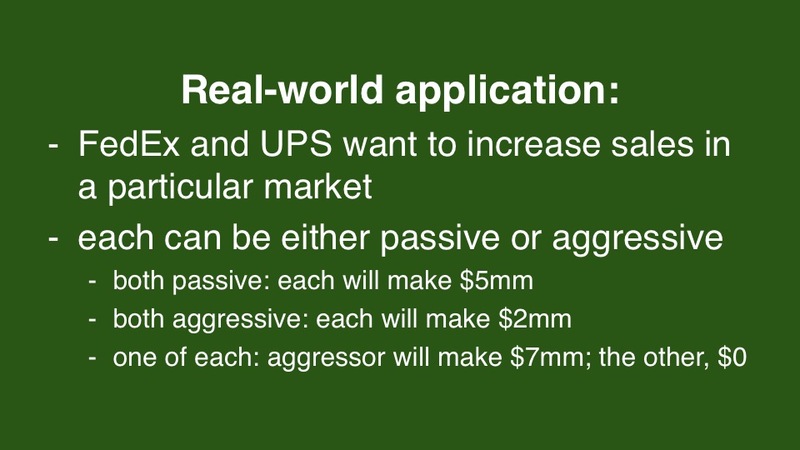 We’ll also look at a potential real-world application of the Prisoner’s Dilemma, where two companies in a new market need to decide whether to be passive or aggressive with their approaches. Finally, we draw the concept of Nash equilibrium to the Final Jeopardy! environment. 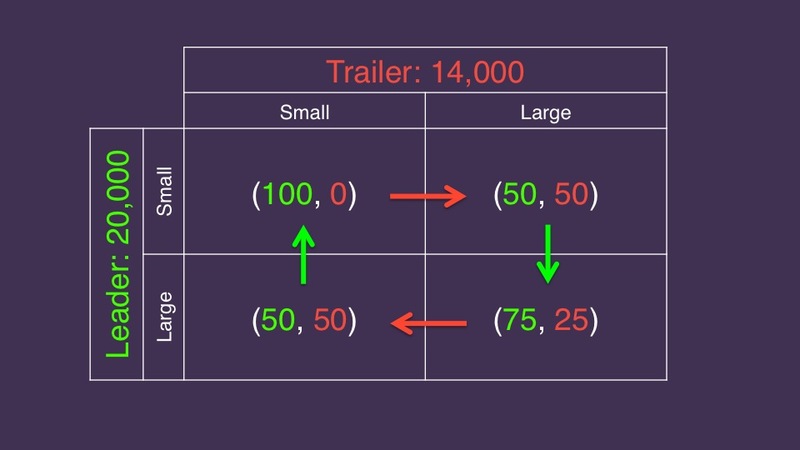 In our sample situation, the leader has 20,000 and the trailer has 14,000; there exists the possibility for some mind games. With “proper” wagering by both, the leader might be tempted to wager small, guaranteeing a victory if his opponent makes the “proper” wager. The trailer might wager everything as a result. We can put this into a payoff matrix, and see that the decision-making process goes around and around. I insist there’s a Nash equilibrium here – but where is it? The mathematician John Nash, for whom this equilibrium is named, insisted that instead of thinking just for himself, the group as a whole should take each other’s optimal outcomes into account and work together to achieve those ends. For those of you who haven’t seen A Beautiful Mind – and I highly recommend you do so – here’s the scene in which Nash, played by Russell Crowe, supposedly invents the concept (so that he and his friends can “all get laid”). Thank you so much. I can understand very easily !!!. The payoff matrix for Final Jeopardy is great… but it seems to me to show the opposite of what you intend. In particular, it shows why your rule #1 for wagering actually sells the leader short. 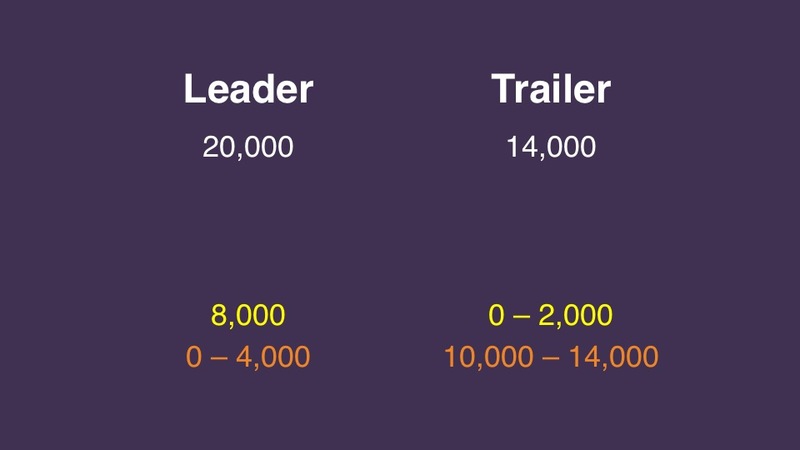 Look at it this way: if the leader goes small, he will either have a 100% chance of winning (trailer goes small), or 50/50 (trailer goes big). 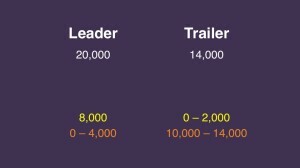 On the other hand, if the leader goes big, his chances are either 75% (trailer goes big), or 50/50 (trailer goes small). The worst case in both choices is a 50/50 shot, but the upside for the leader is higher by going small. But this runs counter to your advice! 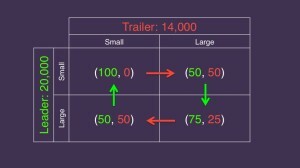 Of course, the above analysis assumes that the trailer makes an arbitrary decision about whether to go big or small. Also, if the leader does go small, even if they have an overall better chance of winning, they open themselves up to the possibility of getting the question right, and STILL losing. 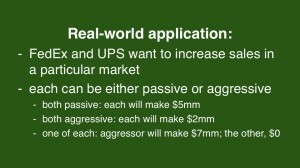 This possibility seems so unpleasant that it may be reason enough to stick to your rule #1…. Hi, ArthurJennings – glad to see you are thinking ahead! 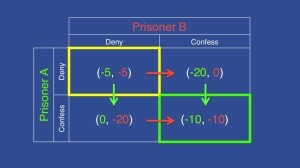 I cover this in later installments: Part Five of my wagering tutorial (http://wp.me/p4737U-xH) and Guide to Game Theory: Mixed-Strategy Nash Equilibrium (http://wp.me/p4737U-ud). Let me know on those if anything is unclear! What’s your analysis of how a game should be played where two players end up tied going into FJ, with the third player being insignificant? (Example: A has $12,000, B has $12,000, C has $3,000) The “sensible” thing to do for players A and B would seem to be that both wager 0, since they can’t be caught, and would be guaranteed a tie if both comply. However, is there some element of “bet to protect” that comes into play here? Would one of the contestants even think of wagering up to $9,000 for a chance to be the lone winner? Each player can wager either zero or everything. There is no in-between. See the very last entry in Part Two of my tutorial.